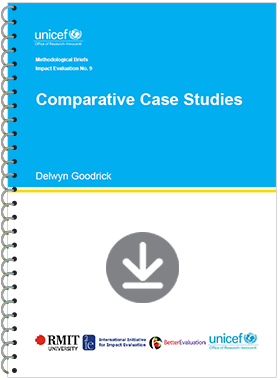 Comparative case studies involve the analysis and synthesis of the similarities, differences and patterns across two or more cases that share a common focus or goal in a way that produces knowledge that is easier to generalize about causal questions – how and why particular programmes or policies work or fail to work. They may be selected as an appropriate impact evaluation design when it is not feasible to undertake an experimental design, and/or when there is a need to explain how the context influences the success of programme or policy initiatives. Comparative case studies usually utilize both qualitative and quantitative methods and are particularly useful for understanding how the context influences the success of an intervention and how better to tailor the intervention to the specific context to achieve the intended outcomes.